I had an amazing time collaborating on this shoot - Aleira Moon was a ball of energy and whimsy, and her creative vision was definitely one I fell in love with as soon as I first laid eyes on her work. The idea behind this shoot was "Colour Punk", and while incidentally a lot of the final shots turned out beautifully in black and white, playing in this colourful abandoned building with so much gorgeous light pouring in made for a great day. Lucie Stauff was the talented soul behind the hair and makeup - I've never worn such intricate braids before, and I'm still left in awe of her patience and skill! 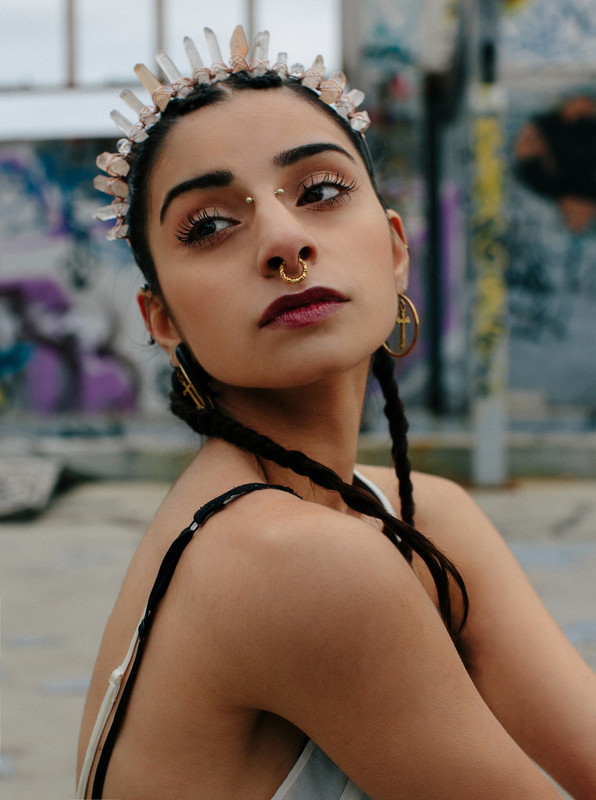 Lastly, I especially fell in love with the stunning headpiece by Crystal Eclipse Crowns - Michelle, the Melbourne-based creative behind the label, makes magical crowns, hair combs and other jewellery with unique gemstone pieces. Yeah, the amazing results of this collaboration have left me on a creative high, to say the least.